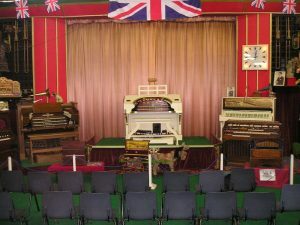 The Museum also houses the 1926 model ‘H’ Wurlitzer which was once installed in the Leicester Square Theatre, London. It was despatched from the company’s North Tonawanda factory on Dec 7th, 1926 and installed in the Stilwell Theatre, Brooklyn, New York where it would have served both to augment and fill-in for the theatre’s orchestra. It is believed that the organ was repossessed by the Wurlitzer company soon after the arrival of the talkies. In 1930 it was exported to England and installed in Buchanan’s Theatre, Leicester Square, London (now the Leicester Square Theatre. It remained ‘in situ’ until the theatre was modernised in 1968. David England, a well known enthusiast, bought the organ, which eventually found its way to Cotton.The long job of rebuilding it at Cotton began in 1975. The organ was officially opened on the 10th October 1982 with Nigel Ogden and David Ivory at the console. In 1995 Mr and Mrs Ken White of Colchester bought the organ (which had been on lease to the Museum) and presented it to the Trustees, thereby ensuring its future at Cotton as part of the collection. The Organ (which can also be played mechanically) is specially featured during the season on the last Sunday afternoon of each month by the resident organist.